Here is the smile we’ve all been waiting for! Thank you all for your kind words of support, which came primarily via Facebook. After reading some of your comments, I realized how depressing Anthony’s medical history sounds. Yes, he has had some difficult times, but really, he has only had four serious medical issues in his 21 years, which is really good for a kid with such severe cerebral palsy. Obviously, the abuse that caused his disability to begin with was his first challenge. That was back in 1994. His birth mom was mentally ill and abusive. We don’t know who Anthony’s birth father was, not sure his mother even knew. Anthony was placed in foster care at 17 months of age and then he joined our family in 2000. It was amazing how easily Anthony fit into our family and he had many happy years with no medical problems. In spite of his disability – or perhaps because of it – he is the happiest kid you’d ever meet. He loves people, he enjoys being out and about. He loved school when he was able to go and his smile can light up a room, as you can see by the photo above. He is currently a favorite here in the ICU at UMass. His other three medical problems were mention in the previous post: 2006 spinal fusion, 2010 intestinal volvulus / J-tube and 2014 pneumonia / tracheostomy. Between these times, he was happy and for the most part healthy. Although doing the laryngotracheal separation was a difficult decision, as long as Anthony recovers and gets back to his typical happy self, it’s well worth the risk, because his quality of life will be much better. Nothing is more important than being able to breathe easily. Breathing is good. Anthony has never had a very good airway. When he first joined our family in 2000, I remember listening to him snore while sleeping and thinking he may need a tracheostomy some day. But we managed his airway with positioning, occasional oral suctioning and Anthony’s nice strong cough. Even though he did sometimes have trouble handling his own saliva, he was always able to clear his lungs with a cough. In 2006, he had a spinal fusion (lots of posts about this surgery if you search some of the earliest posts on this blog). The fusion was for his scoliosis and the surgery was very successful. His orthopedic surgeon was very happy with his nice straight spine. Problem is that the surgery and/or straightening seemed to make his gastric reflux worse. Maybe his old fundoplication unwrapped or just having a straighter esophagus was enough to bring stomach content up to the back of his throat. Again, his strong cough helped, but over time, it got harder and harder for him to tolerate his G-tube feedings. In 2010 we decided to switch out his Mic-Key button (G-tube) for a GJ-tube. This is a longer tube that is threaded via the g-tube opening through the stomach and into the jejunum (first part of the small intestine). With a GJ-tube, feedings and/or medications can be given in the stomach or small intestine. Feeding via the small intestine greatly improved his reflux and things went well for a while, until one morning when there was blood coming out of his tube. We took him to the ER and long story short, he had an intestinal volvulus (also documented in this blog). This was an emergency surgery situation that required a bowel resection. Eventually, he had another surgery to place a separate J-tube below – or down-stream from – the bowel resection. During this very long recovery he came close to having a tracheostomy because his airway was floppy and his tongue was sometimes blocking his airway. But once he was fully recovered his airway improved. Not great, but also not to the point of needing a trach. Fast forward four years…Rich and I decided to take a vacation, just the two of us. Anthony and Natasha went to a skilled pediatric facility, Eric went to a respite house and Aaron went to Auntie Joyce’s house. This involved lots of work and coordination in order to get away, but we had a wonderful week in the Turks and Caicos. The day after we got home, we got a call from the nursing center saying Anthony had a gagging episode and had aspirated. He was transferred to Lowell General Hospital where they wanted to admit him, but we had him transferred to UMass Memorial University Campus. He was obviously sick, but we were able to take him home on antibiotics. But he was not improving and his lungs and airway were in bad shape. 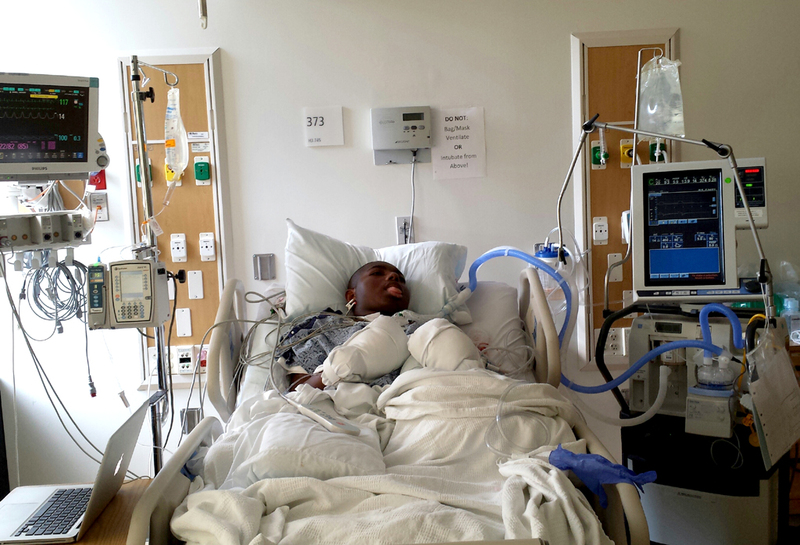 He ended up being admitted to the ICU and placed on a ventilator. After a week in the hospital he came home, but his airway was just not getting better. It was very hard to watch him struggle to breathe. He had to be positioned very carefully in order to maintain a decent airway. It was time to revisit the tracheostomy. We had him readmitted because again he was not improving and we had an ENT (otolaryngology) evaluation as it seemed that a tracheostomy could no longer be avoided. After much research and consultations with Anthony’s doctors, we decided that the best option for Anthony would be a laryngotracheal separation rather than just a tracheostomy. This was a more involved surgery but would help Anthony with several of his problems: mechanical airway obstruction (big tongue) and sleep apnea that went along with his obstruction, chronic aspiration of saliva and reflux which was still a problem because of normal stomach acids. 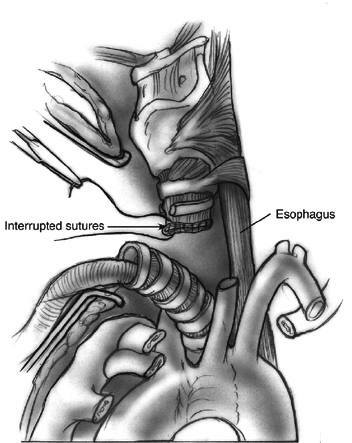 A laryngotracheal separation is different from a regular tracheostomy because rather than just placing a trach tube in the airway, the trachea (wind pipe) is actually disconnected from the upper airway. The trachea is separated and the upper portion is stitched closed and the lower portion is brought out and sutured to the neck, so that he is a total neck breather. This means that the nose and mouth are completely cut off from his lungs leaving no way for saliva or stomach acids to get into his lungs. 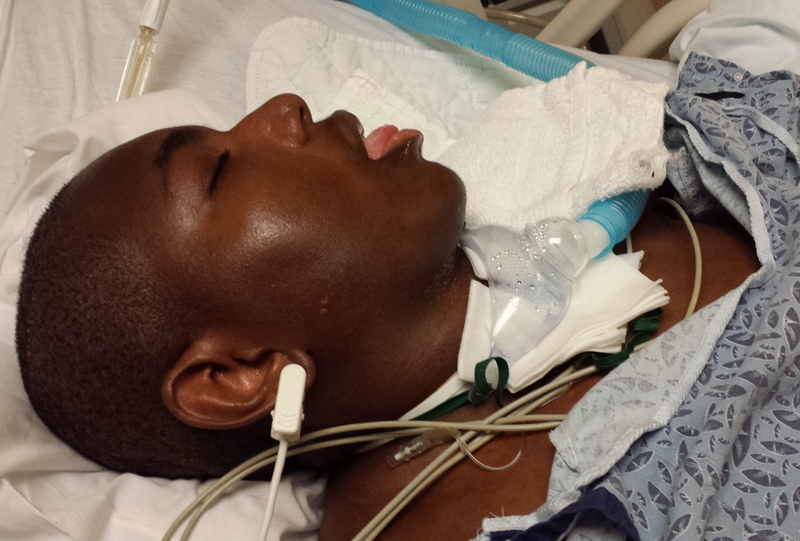 On Wednesday August 6, 2014 Anthony had his laryngotracheal separation. He is currently in the ICU at UMass/Memorial. He was initially on a ventilator post-operatively, but they were able to wean him off the vent within 24 hours. It is such a relief to see him breathing easily! Eric is so comfortable and happy in his new Hoyt Running Chair! 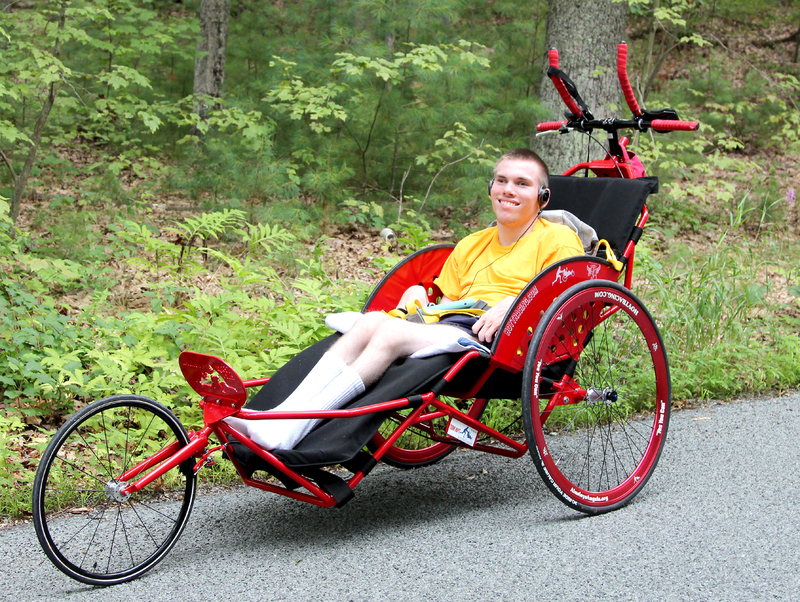 Eric would not have his new running chair without the help of family, friends and community. We would like to take a moment to thank all those who helped make this possible. TEAM HOYT Running Chair for Eric! 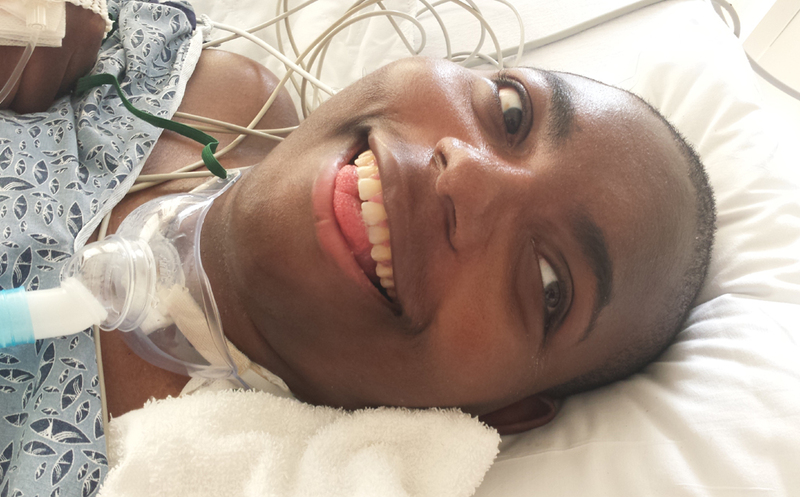 Eric is a very personable young man with spastic quadriplegic cerebral palsy. He is unable to walk and is wheelchair dependent. One of Eric’s favorite things to do is to go for walks and runs with his mom and dad. Most people around our small town of Grafton Massachusetts know the familiar site of the Bissells pushing Eric around town. Over the years, Eric has had several special needs joggers, which he has either worn out or out-grown. He has again out-grown his current jogger and we have been looking for options for adult special needs joggers. At this point, Eric is 20 years old, 130 lbs and hopefully finished growing! The best solution for Eric would be a Team Hoyt running chair. But these chairs are custom made and very expensive. For this reason, we have partnered with a non-profit group called “Ainsley’s Angels” to help us organize a fundraiser for Eric. With the help of family, friends and community we hope to get a custom Hoyt chair for Eric. Any amount you can give would be very much appreciated and tax deductible. Thank you!